I have a tip for saving money on ACV with the Mother in it! I see an Acupuncturist and Natural Therapeutic Specialist and he made this suggestion. 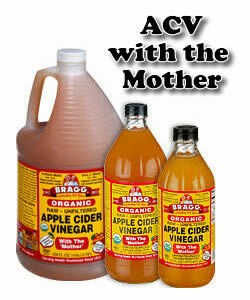 He said if you buy a small bottle of the organic ACV (Bragg) with the mother and a big bottle of store brand ACV you can add an ounce of the organic with the mother to the brand without the mother and the mother will grow and multiply. Doing this will help keep costs down by saving the organic and using the store brand. I wanted to pass along this suggestion for those who are on a really tight budget. Thanks so much for taking the time to pass on this idea of how to make your organic apple cider vinegar stretch farther, saving money for the user. I hadn't really thought about it before, but it does make sense that the live organisms from the mother in the organic apple cider vinegar would continue to grow in the typical filtered ACV. In most parts of the US, Bragg is pretty inexpensive, so I always just go for the fully organic ACV. Here in Australia, it is much more pricey (imported! ), so it's more of a stretch, but still do-able for the amount you actually use. Nevertheless, I do know that many people are truly struggling financially and even a couple of dollars can make a difference in regards to whether or not they can afford to avail themselves of the wonderful benefits of using apple cider vinegar for health and/or detox purposes. My verdict is: If you can afford the couple of extra dollars to buy the Bragg organic apple cider vinegar, go for that as your number one choice. You'll only be using at most a few tablespoons per day, so that will last a good while. If you just can't stretch to the expense, do as Barb has cleverly suggested and get a bottle of the organic ACV with the mother in it (like Bragg) and use it to "feed" the pasteurized and filtered bottles of clear apple cider vinegar that you can buy at your grocery store. Either way, adding some ACV with the mother in it to your daily routine is sure to help improve your overall health and well being. Thanks again, Barb, for your great suggestion!